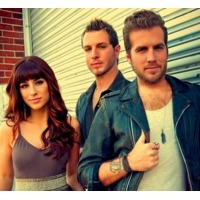 Gloriana is an American country music group founded in 2008. It is composed of brothers Tom Gossin and Mike Gossin (vocals, guitar), as well as Rachel Reinert (vocals, tambourine) and, until July 2011, Cheyenne Kimball (vocals, mandolin). Before the band's foundation, Kimball was the 2002 winner of the competition America's Most Talented Kid and a solo artist on Epic Records. Gloriana released its debut single "Wild at Heart" in February 2009, which was a Top 15 hit on the U.S. Billboard Hot Country Songs chart. The group's self titled debut album, Gloriana, was released on August 4, 2009.